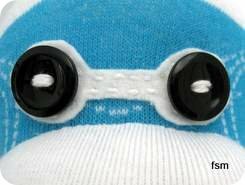 How to make a sock monkey toy from blue high top socks and how to make his super cool eyes that match his laces. 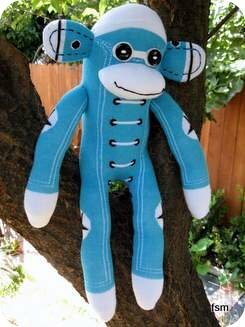 Custom made stuffed monkey soft toys are the best, you'll love hugging these socks. Step one: You will need high top socks. 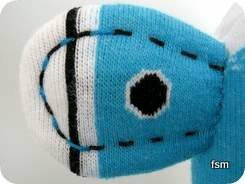 Make the body, arms, legs and mouth of your monkey toy by following the basic sock monkey pattern and instructions. Eyes: The eyes were made to match the laces that are printed on the high top socks. First of all, cut a piece of white felt much larger than needed and lay over the eye area. Attach the black buttons by stitching through the button holes and felt into the monkeys head. After the buttons are secured, trim the felt to the desired shape and then stitch around the felt with white thread. I have found that it is easier to stitch the felt onto the eye area and trim it after wards, especially if the felt is small like on this little sock monkey. Depending on how the felt is stitched to the toys body, it can sometimes move or is pulled out of place, so what ever works for you is the best. Ears: Sew, stuff and embroider first with black thread and also with blue thread for some extra detail. TIP: Customize your monkey by adding unique eyes and creating extra fine details. Repeating a print on the socks (like the laces on this sock animal) will set your stuffed little monkey out from the rest.